Kristine Opolais triumphed in today’s telecast of Madama Butterfly from the stage of the Met. Her reading of the role is matched in my experience only by those of Antonietta Stella and Diana Soviero. This opera, more so than any other standard repertory work, depends on the soprano who plays the title role. When an artist of vocal power, stamina, and poetry who also has the emotive energy of a Duse sings Cio-Cio-San, Puccini’s music can bring tears from the sands of the Atacama. Opolais is such an artist. Her voice is rich and projects. She’s almost a spinto. Now 36, she’ll likely get there before she’s 40. Butterfly is perhaps the most demanding role that Puccini wrote for a soprano and I include Turandot. She ended her entrance piece with the d-flat that’s in the score and like the rest of her notes it was a good one. Her portrayal of the discarded lover who doesn’t know she’s been jilted in the second act was vocal acting at its best; she could have made even Oscar Wilde shed a tear. Her death scene was at the same high level. This is an artist with the whole operatic world ready for her to storm. I was at the premiere of this production directed by Anthony Minghella on September 25, 2006, opening night of the 2006-7 season. I haven’t seen it since the lst HD telecast in 2009. It has improved over its 10 years life span. Part of this improvement is that it was better performed this time around. Butterfly’s child is played by a puppet controlled by three men clad in black. This isn’t quite as dopey as it sounds. The same three guys have been doing this work at the Met for a decade and have it under control. It’s better than it was when I first saw it 10 years ago. The colors are vivid and the costumes opulent; the spare and angular set with its two levels suggests more than it actually has onstage. The only change for the worse was the pulling out of Butterfly’s sash as she dies. As Minghella staged it, the sash was bright red, there was just one, and it went out and up behind Butterfly. This time there were two, they were a muted red, and they went to either side of the dying geisha. Roberto Alagna was the frat boy naval officer who uses and then throws away a human being rather than the doll he thinks Butterfly is. I don’t know what navy he was in, but his uniform made me think it was that of Ruritania. He sounded much better than he has on recent outings. His timbre was firm and well produced, except for his last two notes which were strained and dry. It’s lucky for him that the opera ended when it did. Maria Zifchak was the devoted servant Suzuki. She’s been in this production since its inception in 2006. She’s got the part down cold. The same is true of Dwayne Croft except that his light baritone is mostly worn out. It’s hard to make an impression as Prince Yamadori, but the young Chinese baritone Yunpeng Wang did just that. He has a dark and big sound. I think the kid’s a comer. Keep your eye out for him. British conductor Karel Mark Chichon made his Met debut in this run of Butterfly. He is married to mezzo-soprano Elīna Garanča. Interestingly, Opolais is married to the music director of the Boston Symphony Orchestra Andris Nelsons. These three are all from Latvia. Pretty good for a country with a population much less than that of Brooklyn. Back to Chichon, he led a taut and wrenching performance that got everything Puccini needed from the Met’s great orchestra. The Met should definitely bring him back. I’ve seen Butterfly more times than I can recall at houses all over the world. The best was the first. It was the Met’s 1958 staging by director Yoshio Aoyama with sets and costumes by Motohiro Nagasaka. The above mentioned Antonietta Stella was their riveting Butterfly. The Japanese team had Stella move like a real geisha. Opolais plays Cio-Cio-San like a passionate Italian, which she really is. The Japanese also had Butterfly commit harakiri (ritual disembowelment). Minghella opted for jigai (severing the blood vessels of the neck). The result is the same with either technique. This staging while very good and full of striking images doesn’t seem to me or my failing memory to have the same visceral impact that Aoyama and Nagasaka brought to the stage of the old Met. Also, they didn’t use a puppet in place of a child. The puppet technique that Minghella put in his staging is Japanese. Thus it’s likely that the Japanese production team knew about this puppet art. It’s also likely they would have thought that using a puppet in place of a human in Madama Butterfly was goofy. The strangest Butterfly I ever saw was that by American director Robert Wilson. He solved the problem of Butterfly’s son by omitting him entirely. I saw his production at the Bastille Opera in Paris more than 20 years ago. Its style was Nuevo Bizzaro. Nobody in the cast looked at each, rather they stared at the audience. They also looked like a chiropractor was desperately needed as they walked like robots in a silent movie. Apparently the production is still active at the prison. Actually, the house looks more like railroad station than a jail. Of course, the Europeans like it – both Wilson’s Butterfly and the auditorium. Gary Halvorson’s TV directing had too many closeups, some of them really close. They highlighted every wrinkle and blemish the still young Opolais has. It’s hard enough to play a 15-18 year old without a TV camera up your nose. The current Met production has many colorful and vivid images that are best viewed from a distance. Halvorson needs to be reintroduced to wide angle lenses. Still a great show. If you haven’t seen it, it will be repeated next Wednesday. Special note: Unlike my two previous viewings of this production, the audience applauded at Butterfly’s moment of rejoicing at Pinkerton’s return in the second act. Any decent performance of Puccini’s opera elicits this response, the only exceptions are those caused by a really good director who thinks he know more about the theater than Puccini or by a bald puppet masquerading as Butterfly’s son. It’s a tribute to Opolais that she got the crowd to applaud despite the puppet. Loved Opalais since buying her Rusalka DVD. Best singing actress since Diana Soviero. I call Opalais “Callas with a better voice.” Also loved old Met production with Stella and Eugenio Fernandi. Where can I purchase the DVD for this opera? I would like roberto alagna’s madam 2016 as I went to the performance and met him backstage! 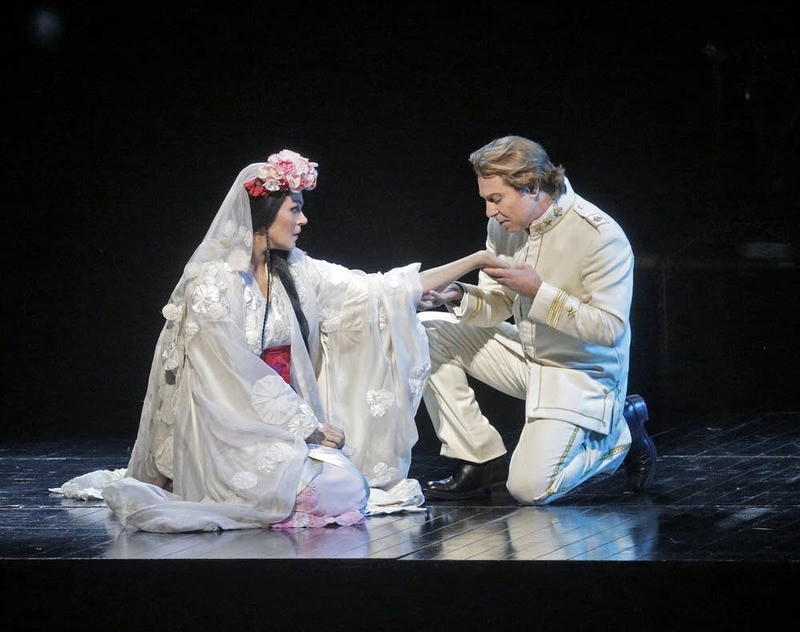 Where can I buy the DVD for the Opolais/Alagna Met Opera Madama Butterfly?